Yossi Klafter, President of the Tel Aviv University and Honorary President of the Slovak-Israeli Scientific and Innovative Society visited Slovakia during the first week of October 2017. The trip follows several visits of Slovak academic dignitaries in Israel in 2017 and reflects a new dynamic of bilateral relations between Slovakia and Israel in R&D in recent months. In the frame of his trip to Slovakia, President Klafter was an honorary guest at the ceremony celebrating the 65th Anniversary of the establishment of the Slovak Technical University in Košice. 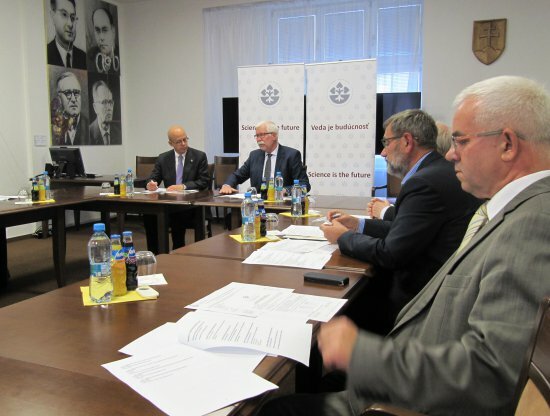 In Bratislava President Klafter had a comprehensive discussion with the Chairman of the Slovak Academy of Science, Pavol Šajgalík (photo enclosed) and visited selected institutions of the Academy. President Klafter did not miss an o opportunity to visit a birthplace of his parents, village Giraltovce in East Slovakia.